Broken your iPhone 6 screen? Maybe you can see bleeding or black ink spots on the iPhone 6 retina display screen or possibly the touch screen has dead spots or even bad cracks in the screen glass. You will need to have the whole iPhone 6 screen replaced. The replacements iPhone 6 screens are brand new original quality screen units. Please note this screen replacement service is not suitable for the iPhone 6 Plus. A broken screen is classed by Apple as a non-warranty repair and they will charge you accordingly. This iPhone 6 screen repair service is a cheaper option and performed to our exacting standards. If you choose not to opt for our Express Repair 24 Hour Fast Track Service our normal repair turnaround times are 3 - 5 working days. We always aim to complete repairs as fast as possible. This is an in-house Apple iPhone 6 repair service, when ordering this service you are required to ship your iPhone into our repair centre for works to be undertaken. Your touch screen digitiser is failing, if we replace the whole screen assembly this will solve your problems with intermittent touch recognition. On all screen repairs we transfer over the home buttons circuits, so your Touch ID function is kept intact. Is LCD replacement included in the screen repair? Yes we replace the complete screen assembly, this includes the LCD and glass touch screen. Our warranty on all iPhone screen repairs is 12 months. Our repair centre is located in Enderby, which is very close to Narborough please feel free to call in with your iPhone 6, Just view our How to find Us page for details on locating us. How long will it take to repair a cracked screen for an iPhone 6? If you choose our Fast Track service your unit will be repaired in 24 hours or less. If you opt for our standard repair service turn round times are 2 - 3 working days. 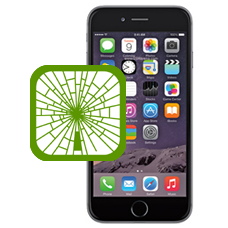 We do not require your SIM card when sending your iPhone 6 in for screen replacement repairs.